February was such a clustermuddle of misery. Between the flu, the weather, sick kids at school, and again…the flu, I was so ready to turn the page to March. Bring on spring, Spring Break, my birthday, and the first pitch of Braves Baseball. Spring recipes including a leek soup and fresh asparagus for omelets. I have a spicy southwest chicken recipe coming up and an experimentation with my favorite muscle mocha protein shake. 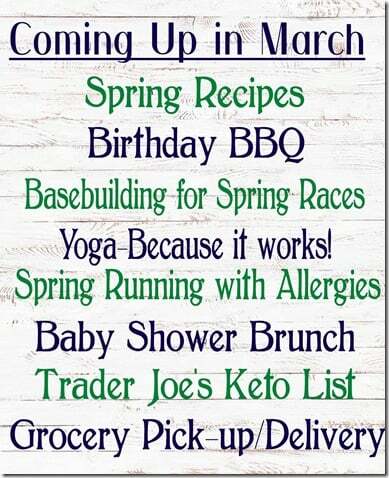 Spring races are coming up. I love these local races with a few people and the zero pressure to PR. Let’s be honest, it will be a long while before I can beat some race times from my early running years. Base building is currently in progress. Yoga is my new favorite way to stretch and attempt to look as absolutely ridiculous as I possibly can. But it’s amazing how much better I feel after only about 4 sessions. There’s something to yoga and I’m going to keep exploring. Are you new to the keto meal plans? Need a cheat sheet for Trader Joes’? I have got you covered. And finally, let’s talk about Walmart. I love talking about Walmart. The People of Walmart, the crimes committed in Walmart, and my fascination with Walmart pick up. LIFE CHANGING STUFF going on here. 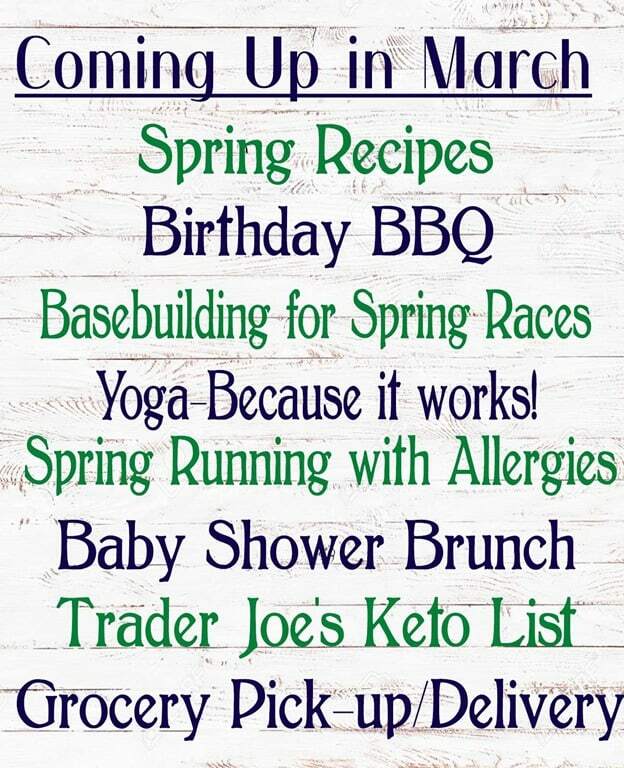 Hang on because March seems to fly by like the rest of the year. Except January. It blows.